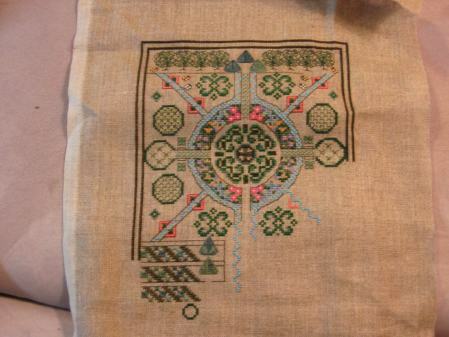 Despite being quite enthralled and busy with the munchkin, I have had some time to do a little bit of stitching. I have made some amazing progress on my German Garden. I am about 3/4 finished now. I am hoping I will have a finish shortly after the new year. I have also been working on Butterfly Rest and have finished the two small pages with the exception of the second blue triangle. I will take a picture of it once I get a better handle on using the new camera we got since our old camera has started to flake out on us. As for the new year, I do plan on making a no guilt start on New Year’s Day. I know I really shouldn’t, but it wouldn’t feel like a new year without a new start. I think I will be starting Alchemical Romance by Ink Circles. I figure it is one of those pieces where I can try and do a symbol or two every week and make good progress. If I remember correctly I have even put some fabric aside for this piece already. I will have to check tomorrow and pull out some threads. Wow your progress is awesome considering you’ve got a brand new baby to take care of!!! Congrats on deciding to do a new start on Jan 1st! Your stitching is coming along well…. congrats. Good luck with your goals for 2008! German garden is coming along beautifull. Wow! That German Garden is lovely! 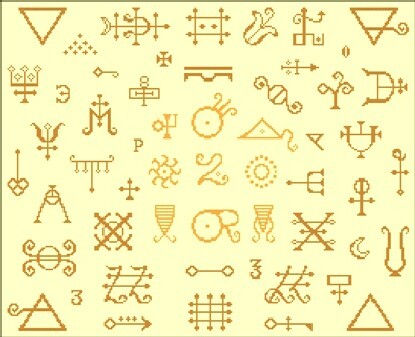 And I’ve never seen the alchemy symbols before. I like. And it does seem the kind of project that’s doable in small chunks. I’ve just had to move to small projects to get anything done, but it’s hard to find ones as interesting as that. Best of luck with your 2008 goals! German Garden is beauitful! Happy new year! Beautiful progress on your garden. I really like Alchemical Romance – what a cool piece. Your goals look great too – I’m hoping for a Mystery 9 finish as well!